In the late 70's and early 80's, these were the genuine old school preppy family vehicle of choice and they just oozed class (and smoke). People of lesser means (like our family) had to make due with Diesel Vdubs or Volvos. While comparable American cars were adding chrome, brougham and opera roofs, the period Benzes were ostentatious in their plain-ness. Detroit went to great lengths to make their hubcaps look like all manner of wire wheels, or alloy wheels, the W123's understated Fuchs alloy wheels seem to have been styled to resemble cheap hubcaps. 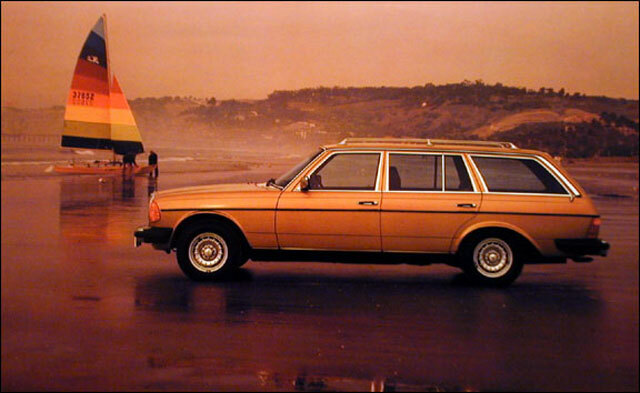 It is the distinctive sound of the Mercedes diesels that I remember most about these cars, and to this day, I can still identify a Benz diesel of this vintage with my eyes closed, and no, not from the smell - "Ladies and Gentlemen, Pop Your Collars".